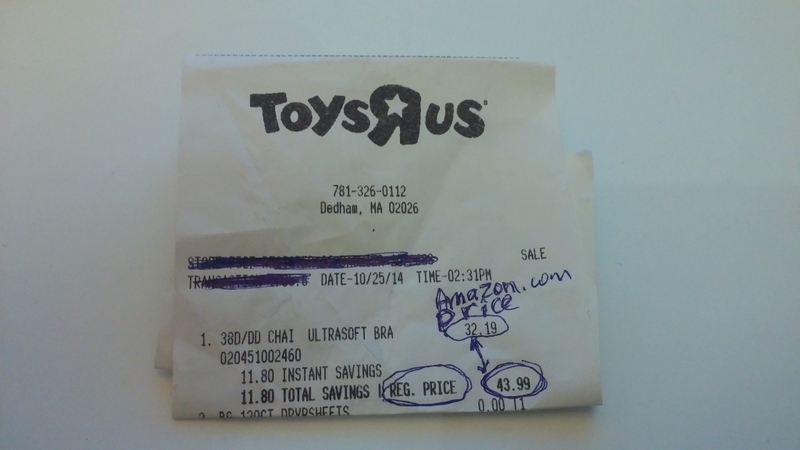 You can save some serious money at Toy R’Us / Babies R’Us by doing price match with Amazon.com – below is an example of how I did it and how you can do it (as well as what you will need). As the cashier was scanning the items, I pulled out my phone, launched Amazon app and scanned the barcode on the bra. 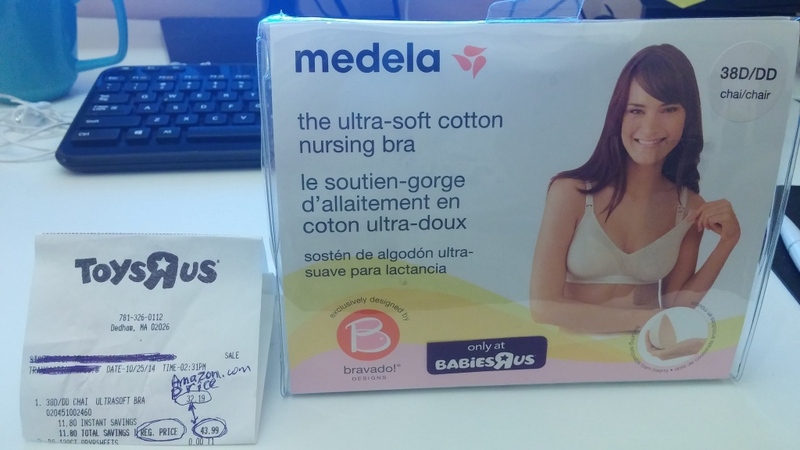 This exact bra did not come up in UPC search, so I searched by name, and fond it (or similar item) for $32.19, showed it to the cashier, and she did the price match on the spot. But there is a catch (read below). Sadly the UPC / Barcode was not listed on Amazon. But an identical product with different UPC was listed, and I got the price match. Basically, big retailers are not stupid and do not want to do price matching (since they either lose money or make very thin margins). To do so, they force manufacturers to create SAME products with DIFFERENT barcodes for compared to those at Amazon. Then they implement an “exact item” price match policy which allows the to actually not do price match. This practice has been around for ages, and comes in many forms (exclusive / unique model numbers, etc). Thus it becomes difficult to get discount, but not impossible. Here is what you can do to get your DESERVED* discount. 1) If cashier refuses to do price match or says that the UPC (barcode) does not match Amazon, immediately ask for a manager. It is best to do so, while you are in line and there are people behind you. Yes it is not a cool move, but will “encourage” the store to give you discount faster, rather than keep people waiting in line, which can lose them a sale. 2) Site store’s price matching policy and INSIST that although the UPC does not match it is identical product, and that you’ve been a loyal customer for many years, and that you can get identical item from Amazon for such and such price. 3) If manager refuses, don’t buy it from them – get the cheaper Amazon product – because they are the same, so why give your hard earned money away? If enough people do this, stores will change their ways. Price match with amazon wasn’t always around – we the customers made big box stores implement these policies. 4) Demand to see the complaints book, ask for manager’s full name, and DO complain. Most likely the manager will give in, after you ask for complaints book anyway. Why did I say “deserved”? It’s simple – because you CAN already get the same product from amazon, often with free shipping and now sales tax! Therefore you should not pay more, just because some stuck up manager is having a bad day. I’m all for business, but giving your money away to corporations is just bad karma!